Ag producer sentiment fell sharply during July as the impact of commodity price declines and concerns about ag trade prospects weighed on producers’ perceptions of both current and future conditions in the agricultural economy. 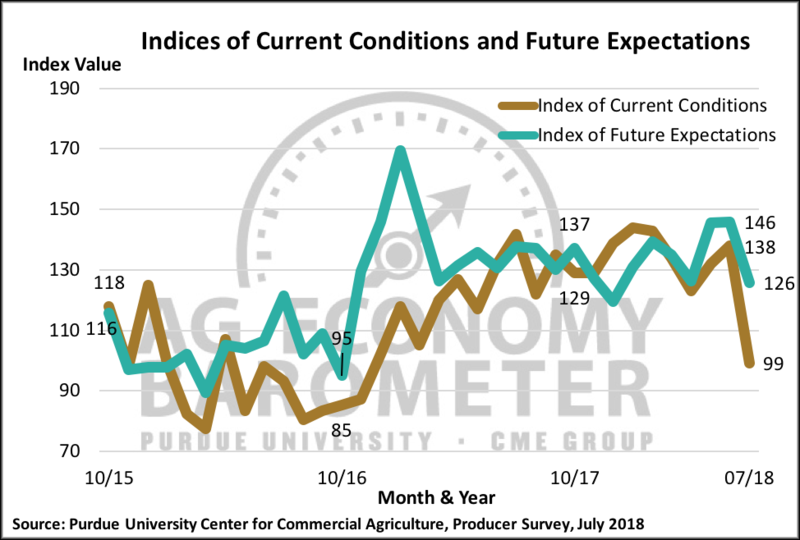 The Ag Economy Barometer declined 26 points to a reading of 117 in July, driven by sharp reductions in both the Index of Current Conditions, which fell from 138 to 99, and the Index of Future Expectations, which fell from 146 in June to 126 in July. This month’s decline, the largest one-month decline in the Ag Economy Barometer’s nearly three-year history, brings it back to the level observed immediately following the November 2016 election, although it still remains well above the low point of 92 reached in October 2016. Figure 1. 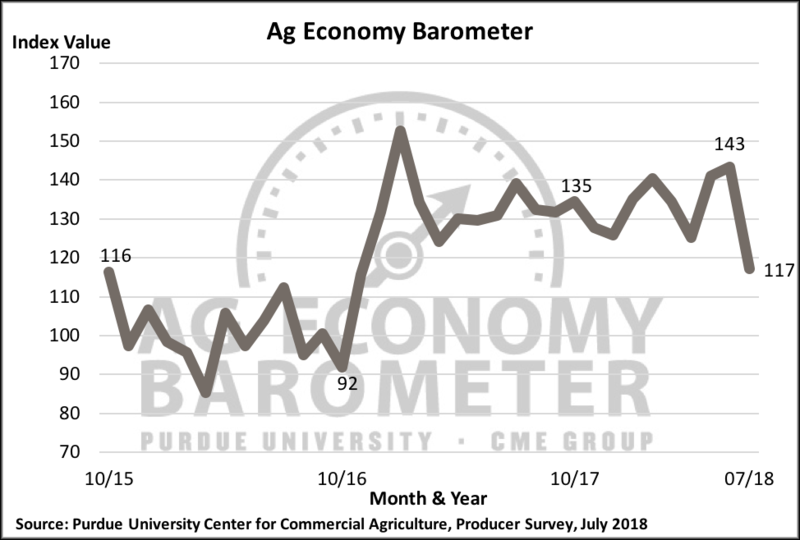 Purdue/CME Group Ag Economy Barometer, October 2015-July 2018. Figure 2. Indices of Current Conditions and Future Expectations, October 2015-July 2018. 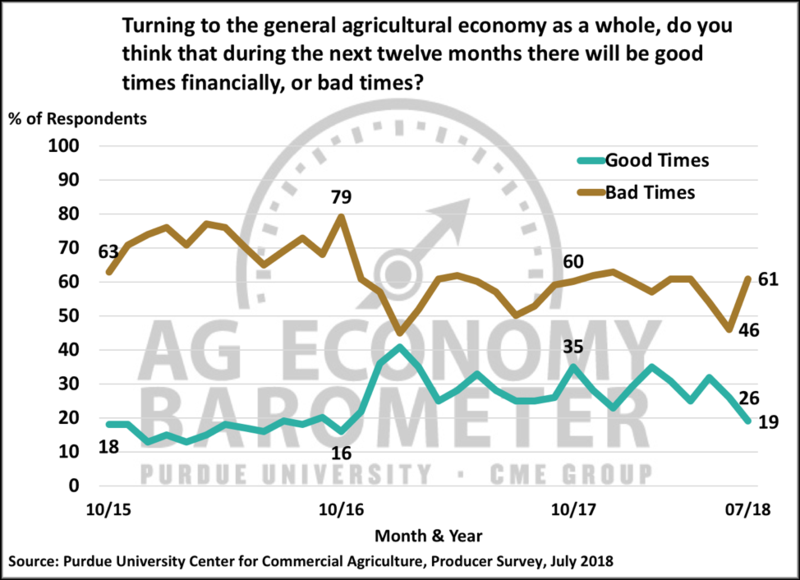 When asked whether they expect good or bad times financially in the U.S. agricultural economy in the upcoming 12 months, producers indicated they were decidedly more negative than they were just one month earlier. In July 61 percent of respondents said they expect bad times in the next year, up 15 points from June, while just 19 percent of respondents expect good times in the upcoming year, down from 26 percent a month earlier. However, when the same question was posed regarding the next five years in the agricultural economy, producers’ outlook in July was virtually unchanged compared to June. 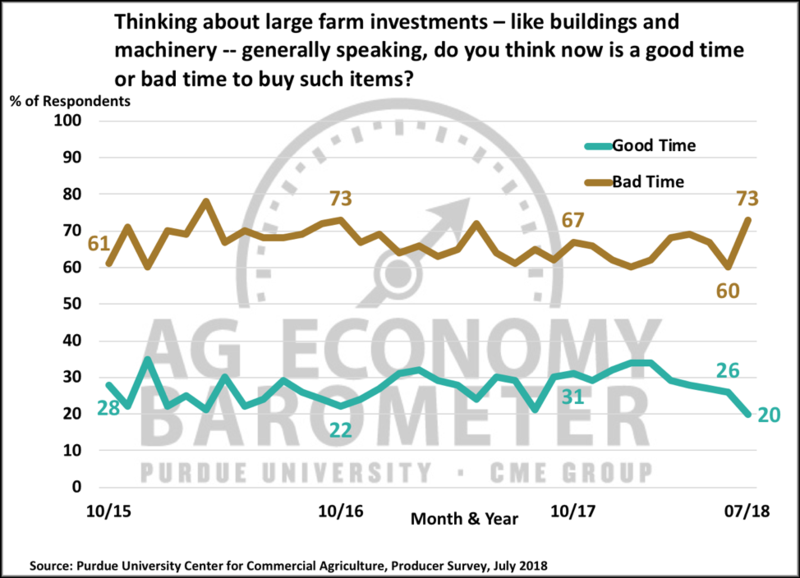 In July 47 percent of respondents said they expect good times over the next 5 years compared to 45 percent in June, whereas 32 percent of producers said they expect bad times compared to 31 percent a month earlier. Figure 3. Percentage of producers expecting good times and bad times in the U.S. agricultural economy over the next 12 months, October 2015-July 2018. Each month producers are asked whether now is a good or a bad time to make large farm investments. The percentage of producers indicating it’s a bad time for large farm investments jumped in July to 73 percent from 60 percent in June while the percentage of producers that felt it was a good time to make large investments fell to 20 percent from 26 percent. Analyzing the good and bad time responses jointly, this was the most negative response to this question since March 2016 and it’s indicative of the uncertainty clouding many producers’ outlook. Figure 4. Large farm investments, is now a good time or a bad time to buy such items, October 2015-July 2018. Figure 5. Expectations for Dec. 2018 CBOT Corn Futures and Nov. 2018 Soybean Futures Prices Between Mid-July and Fall 2018. On the July survey, producers were asked for their perspective on the likelihood that December 2018 corn futures prices would rise above $4.00 or dip below $3.25 per bushel between mid-July, when the survey was conducted, and fall 2018. A similar question was posed with respect to November soybean futures prices, asking about the likelihood of prices exceeding $9.50 or falling below $8.00 per bushel. At the time the survey was conducted, settlement prices for November soybean futures ranged from $8.45 to $8.64 per bushel and settlement prices for December corn futures ranged from $3.55 to $3.69 per bushel. Producers’ were decidedly negative about the future trading range for both soybean and corn futures. Less than 2 out of 10 producers expect to see corn futures trade above $4.00 per bushel or soybeans trade above $9.50 per bushel. 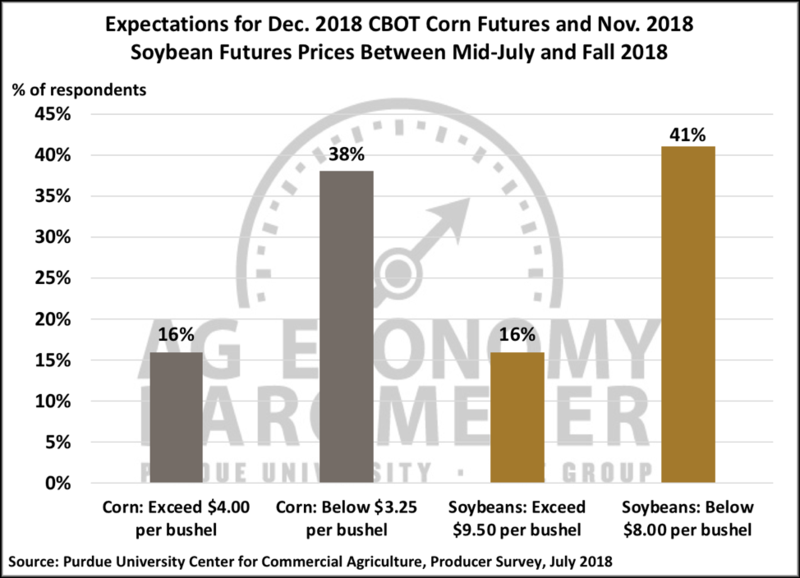 In contrast, approximately 4 out of 10 producers in this month’s survey stated they think it’s likely corn futures will trade below $3.25 per bushel and soybeans will trade below $8.00 per bushel. For both corn and soybeans, prices at those levels would cover variable expenses on nearly all Corn Belt farms but would fall short of covering fixed and overhead expenses, resulting in a significant cash flow squeeze for many farm operators. Figure 6. 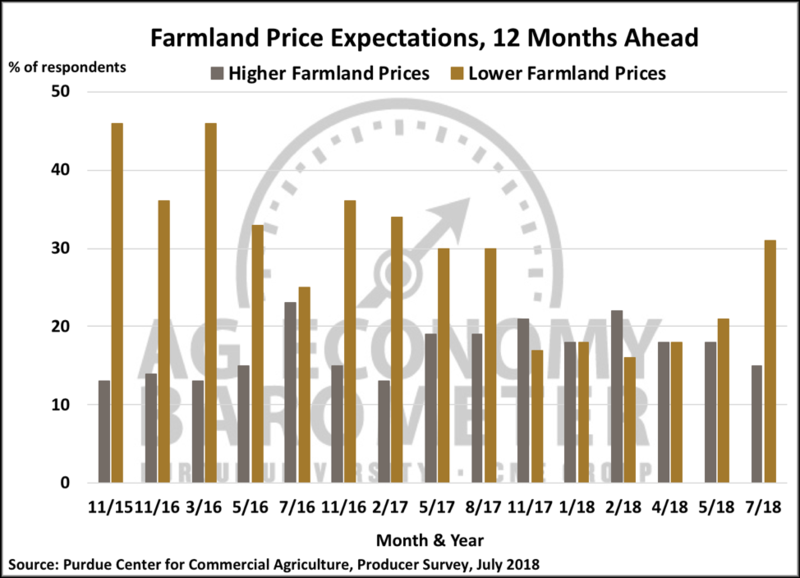 Farmland Price Expectations, 12 Months Ahead, July 2018. Unsurprisingly, the negative outlook with respect to the agricultural economy and commodity prices spilled over into a more negative outlook for farmland values in the year ahead. On the July survey, 31 percent of producers said they expect to see lower farmland prices over the course of the next year. This compares to just 21 percent of producers expecting to see lower farmland values when the May survey was conducted and erases the improvement in farmland value expectations that was observed in surveys dating back to November of last year. 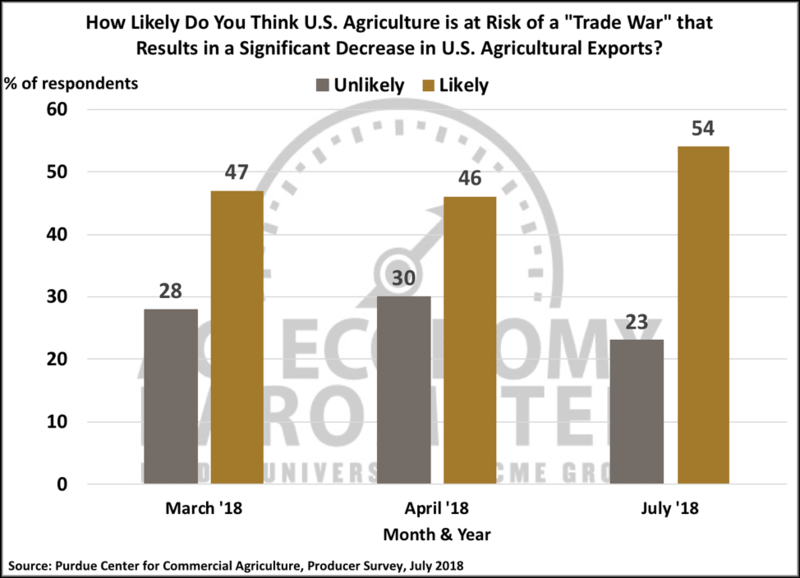 Three times over the last 6 months we’ve asked producers if they think U.S. agriculture is at risk of a trade war that will result in a significant decrease in U.S. agricultural exports, most recently on the July 2018 survey. Not surprisingly, the percentage of producers that think a trade war is likely increased in July compared to both April and March 2018. In July, 54 percent of producers said a trade war that reduces ag exports is likely compared to 47 percent and 46 percent in March and April, respectively. Similarly, the percentage of producers that thought a trade war was unlikely declined in July to 23 percent compared to 28 percent in March and 30 percent in April. 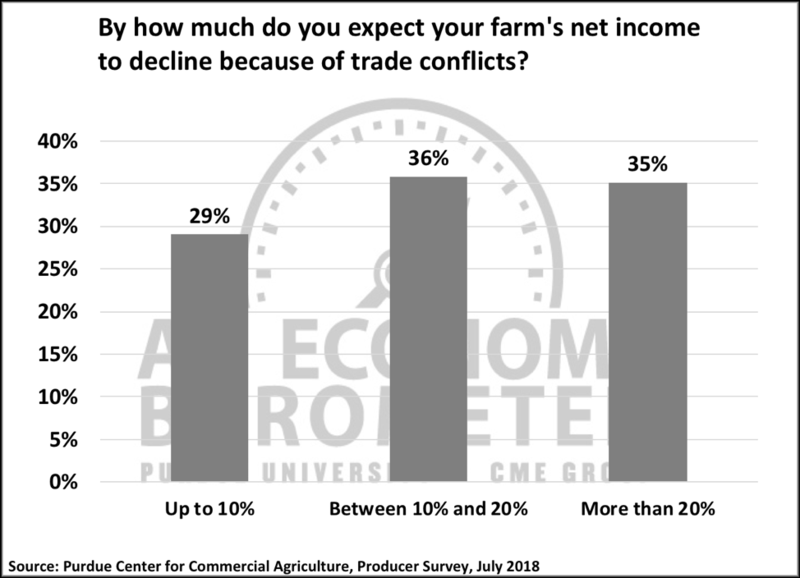 On the July survey, producers were also asked whether or not they expect trade conflicts to reduce their farm’s net income in 2018. Responses indicated that many farms are already feeling the impact of reduced ag exports as 70 percent of producers said they expect reduced net income as a result of trade conflicts. In a follow-up question posed only to those expecting their income to decline, producers were asked by how much they expect their net income to decline. Choices provided were a) up to 10 percent, b) between 10 and 20 percent, and c) more than 20 percent. Responses among these three choices were pretty evenly split with 29 percent choosing up to 10 percent, 36 percent choosing between 10 and 20 percent and 35 percent choosing more than 20 percent. Combined, these results imply that over 70 percent of respondents expect their net income to decline by 10 percent or more as a result of trade conflicts. Figure 7. Do you think U.S. agriculture is at risk of a trade war that results in a significant decrease in U.S. agriculture exports? Figure 8. 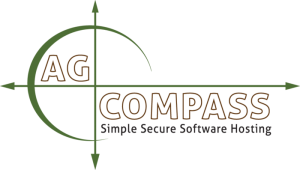 By how much do you expect your farm’s net income to decline because of trade conflicts? Weaker commodity prices and concerns about ongoing trade conflicts with key ag export customers led to a sharp decline in producer sentiment during July. The largest one-month decline in the Ag Economy Barometer since data collection began in October 2015 was triggered by declines in both producers’ perception of future economic conditions and, especially, current economic conditions. Four out of ten producers indicated they thought it was likely that new crop corn and soybean futures prices will trade below $3.25 and $8.00 per bushel, respectively, between now and fall, price levels that will cover variable production expenses, but would fall short of covering fixed and overhead expenses on many farms. Seven out of 10 producers expect trade conflicts to reduce their net income in 2018 and over 70 percent of producers that anticipate a trade related income reduction expect the reduction to exceed 10 percent. Finally, the weak ag economy outlook led producers to have a more pessimistic view of farmland prices in the year ahead in addition to providing them with a more negative perspective on making large farm investments.